PercoDrain 10 is a two-part prefabricated geocomposite drain consisting of a formed polystyrene core covered on one side with polypropylene filter fabric. The fabric allows water to pass into the drain core while restricting the movement of soil particles which might clog the core. The core allows the water to flow to designated drainage exits. PercoDrain 10 is designed for vertical applications. PercoDrain 10 with ¼” height can move more drainage water per foot width than a layer of stone which is 1’ wide and 120” high. All information, images and specifications are based on the latest product information available. We reserve the right to make changes without notice, due to constant improvements and engineering progress. All physical properties are typical values. 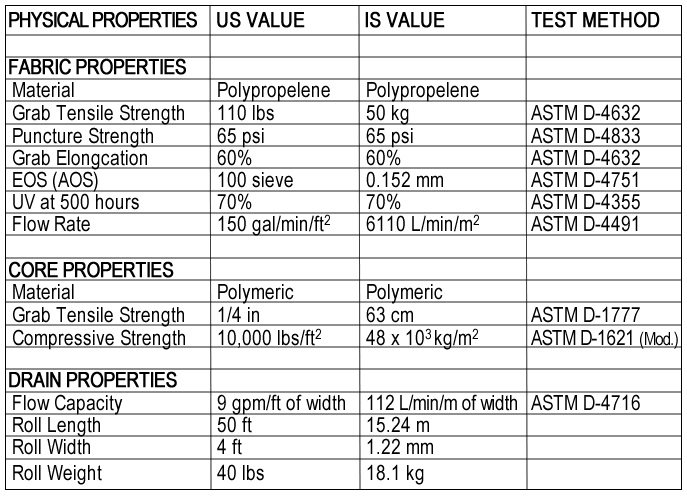 Standard variation in mechanical properties of 10% and in hydraulic properties of 20% are normal. Let us know what you need for your project to succeed and we will get back to you ASAP.